By the time we'd arrived in Ft William (after driving up from Southampton the night before) it was 7am on a fairly miserable Friday morning - but we were in Scotland and we'd all been counting down the days/week/months for a long time. The main purpose of the trip, other than to get out in the hills and enjoy ourselves, was to practice moving over mountainous terrain as a team of three and to practice the skills we'd need for next year's winter trip to Mt Triglav in Slovenia. Now we'd planned the weekend like this; Day 1, skills pratice on Ben Lomond / Day 2, Ring of Steall / Day 3, skills "consolidation" around Glencoe. Unfortunately the snow was less than impressive when we arrived in Glencoe and so we opted to drive slightly further up, to Ft William, and walk half-way up Ben Nevis and practice near the small lake (Lochan Meall an t-Suidhe), on the slopes of Meall an t-Suidhe. Having your kit sorted is essential! After a bit of messing about with kit and packs (we had been in the car for 13 hours by now) we set off up the long, dreary, path to the halfway lochan on Ben Nevis. The snowline was down at around 450m but wasn't compact enough to worry about crampons, walking poles with snow shows were enough to stop most of the slips. One arrival at the halfway lochan (shortly after realising that only one of us, JD, had thought to fill up his water bottle before leaving the car!) we started to practice standard winter drills that we'd need - both over the next few days as well as during the trip to Slovenia the next year. Everything is harder with gloves and insulated layers! We spent most time practicing moving while roped up and working on the movement of the third person up, and down, a face as this was to be the most used technique during our Slovenia trip. A series of loops (double figure of 8 knots) tied into the line between the front and rear walkers provides an easy way of the middle person being able to move along (up/down) the rope. It does present a difficulty when belaying someone but its fairly easy to untie these knots for this to be used. 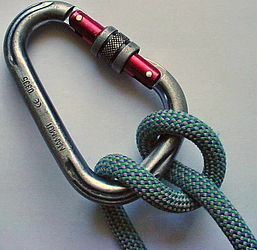 This allows the rope connected to the climbing person (the middle person in this case) to be passed through the carabiner that's attached to the "top person's" harness - they can then pull through and lock-off the rope as the person climbs up - in our case the person at the bottom of the ascent un-coiled loops of rope as the middle person climbed to ensure that free movement was possible whilst still ensuring that everyone was attached securely to the rope. After a few hours of practice we decided to pack up and start the descent - prior to leaving we'd all agreed that our aim was to reach the car with an hour of daylight to spare as this would give us a "spare" hour to cover any issues that may arise and major changes in weather conditions that could slow us down. Shorts, really? In December, on the Ben?! We stopped and had a quick chat with the guys, firstly to make sure that they knew what they were doing as they all had shorts and trainers on(!) and secondly just to be polite. We pointed out that nearer the top the weather was very different (lots of clag around 800m + and high winds) and that they may want to think about not going too much further in their current state of dress. They assured us that they were fine and well aware of conditions and clothing requirements and pressed on - now you may think that we were slightly over-sensitive and should have just left them to it but the three of us were/are all of the same opinion: if we ever need to be rescued in the mountains then 1) we want it to be as an absolute last resort having done everything possible to avoid it and 2) we don't want Mountain Rescue to be occupied by idiots who have underestimated the situation or are simply not prepared. Leaving Romsey behind at 2pm on a Saturday may seem like a crazy idea when the aim is to travel to the foothills of Cadair Idris in Snowdonia National Park but there is method to my madness! The idea was to arrive around 6pm, park the car and then head up to Llyn Cau (Lake Cau) and set up the tent for a night of Wild Camping and then set off early the next morning on a circular route to the summit of Penygadair (893m) via Craig Cau and Mynydd Moel (863m) before returning to the car and heading home! So it was almost bang on 6pm that I pulled into the car park just off the A487 at Minffordd - unfortunately there is no ticket option for an overnight stay so paying £6 to the (very eccentric) owner of the campsite a few hundred yards down the road achieved the required parking spot for the night. I thought I'd take a quick break from walking and mountain related blogs and share my initial thoughts on the Boardman CXR 9.0 Cyclocross bike following today's first outing and CX style ride. Ok, ok, I know I said the Spin (below) was "the" bike but as anyone who rides bikes and has that two wheeled bug will know; "there's always room for one more!" It started with a Shimano Dynamic bike fit from Service de Velo - something that I'd been meaning to get done for ages and following some very good review of a new bike shop in nearby Botley (Service de Velo run by Mark Alexander) I decided to book in and get fitted.